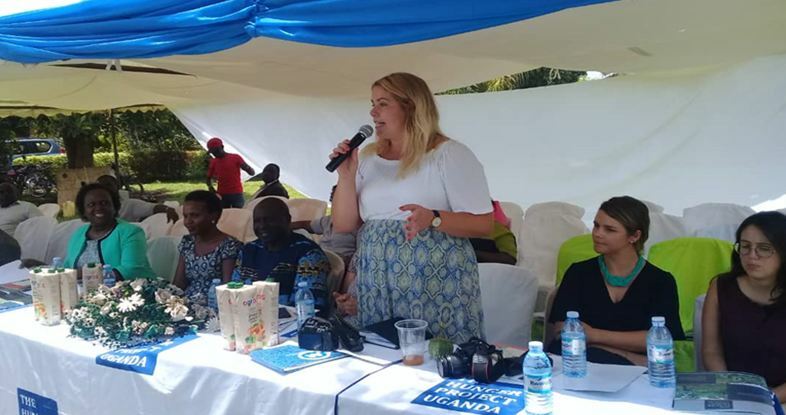 KAMPALA – The Hunger Project Sweden and Uganda, Swedish Society for Nature Conservation in Sweden and its partner organization in Uganda PELUM Uganda received funding from Postcode lottery Foundation in Sweden. The project that is premised on the overall objective of enabling small-holder farmers in Uganda to switch from chemical-based agriculture to chemical-free agro-ecological farming will run from April 2018 – March 2019. It will take place in the two THP-U epicentres of Namayumba in Wakiso district and Iganga. 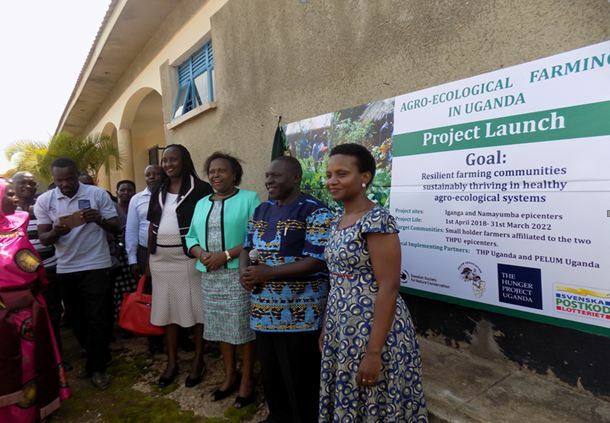 The agro-ecological project launch in Namayumba on September 18, 2018, was attended by various stakeholders including Hon. Betty Naluyima, the Wakiso district local Government Vice Chairperson, various technical and political leaders of Wakiso district, Namayumba Town Council and Namayumba Sub County. 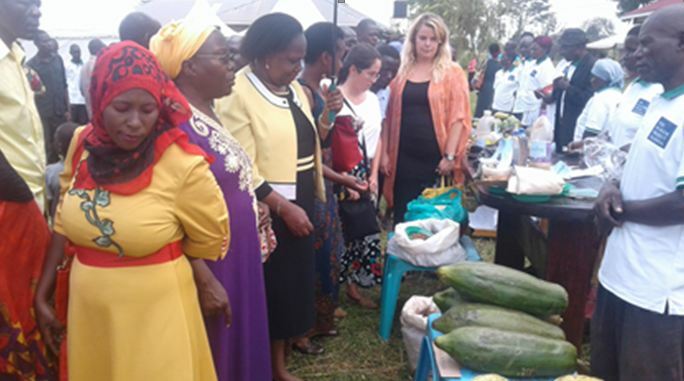 The launch was also graced by Malin Flemstrom, head of programmes at THP Sweden and Gunilla Eitrem, Senior Policy Advisor Agriculture Department of Oceans, Agriculture and Toxics at the Swedish Society for Nature Conservation in Sweden. While officiating at the launch—the guest of honour, Prof. Mwine Julius, a Principal Investigator at Africa Centre of Excellence in Agroecology and Livelihood systems Uganda Martyrs University Nkozi; called on the smallholder farmers in Namayumba especially the young people to embrace agro-ecological farming if they are to preserve and protect nature. “As a professor of Agro-ecology at Uganda Martyrs University where are conducting Bachelor and Master’s degree in Agro-ecology. I am very honoured to launch this project and I know it will be very important for our students while doing field study but also promoting further research in this subject,” Prof. Mwine stated. He commended Pelum Uganda for the tremendous work they are doing and added that the new project being launched was the first grass root project on Agro-ecology. 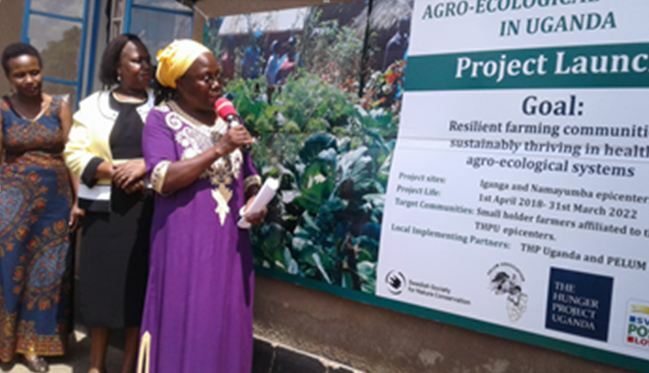 “I call upon smallholder farmers to actively embrace agro-ecology to build our community resilience and enable us to mitigate the effects of climate change for increased agricultural production and productivity,” Stella emphasized. The Agro-Ecology project is inconsonant with the Hunger Project Uganda mission of ending hunger and poverty and the fact that it equips smallholder farmers with knowledge and tools to be food secure while preserving the environment. The Country Director THP-U, Dr. Daisy Owomugasho in her remarks mentioned that primarily, this project is designed to change people’s mindsets from chemical-based farming to organic farming which is cost effective and sensitive to the environment. The Head of Programme at THP-U, Irene Naikaale revealed that that Initially the project will target 180 smallholder farmers and work with them over a period of four years, support them to transform agricultural practices to embrace agro-ecological farming while generating evidence and knowledge that will be used to scale up to other epicentres and the country at large. “We shall train the smallholder farmers using demonstration gardens at the epicentres, establish community seed banks of indigenous seed varieties, take them to exposure visits of progressive agro-ecological farms in the country and also train and support them on issues of market linkages and value addition,” Irene revealed.